What is the future of peer review in ecology? 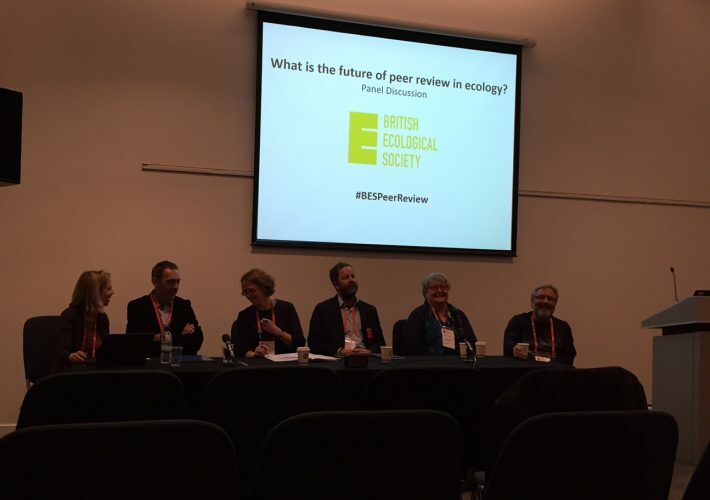 What is the future of peer review in ecology? This was the ambitious title – to discuss in one and a half hours – of the BES publications team workshop at the BES annual meeting earlier this week. The workshop was held in the form of a panel discussion, with a lively debate between the panellists and an engaged audience who had lots of great questions in unexpected topic areas. Jane Hill, Chair of BES publications committee and Chair of the debate, kicked off the discussion. Jane started by outlining the importance of the topic, explaining that the workshop was an opportunity to seek the views of the BES community on peer review, as well as gathering suggestions for how we could improve or make changes. The audience were engaged participants in the peer review process. Many were currently serving on editorial boards of journals, while others were early career researchers, wanting to find out more about peer review. Allen Moore, EiC of Ecology and Evolution set up the journal to provide an ‘author-friendly’ review and publication process. Allen questioned whether a paper that has already been through the peer review process at one journal really needs to start at the beginning for another journal. Patricia Morse, Managing Editor of American Naturalist, a journal which recently changed from single-blind to double-blind review, gave an overview of her experience with this model. Nate Sanders, Senior Editor of Journal of Animal Ecology, talked about the importance of all ecologists being involved in making sure that the best science, wherever it may come from, is published and the review process should ensure that this happens. Andy Robinson, Senior Vice President and Managing Director, Society Services at Wiley emphasised the significance of peer review in making published literature different from freely available web content, highlighting the importance of the integrity of peer review. He also recognised the need for a more efficient process where millions of hours per year are spent on peer review. Elizabeth Moylan, Senior Editor, Research Integrity at BioMed Central discussed increasing transparency in peer review and how it can be made more open and accountable. Elizabeth was keen to see more experiments to improve peer review and most importantly, the availability of the data behind these experiments. Key themes discussed ranged from integrating pre-registration into current publishing practices, making data available to reviewers and making reviews available to readers to how to make the best use of the already overstretched researcher’s time and how to harness the enthusiasm and train the next generation of reviewers. Allen made the case for giving more credibility to the review process through pre-registration, where the hypothesis and experimental design for a piece of research are submitted before the research is carried out. If for example, an unexpected result is then discovered, this could then be documented, as such, in the paper, making how the science occurred more honest and transparent. However, there were concerns, in particular about the pre-registration process giving busy ecologists more work. Nate discussed the great things that can happen when reviewers really engage with the data behind a paper and the missed opportunities for readers when the conversations between reviewers and authors that take place during peer review never emerges after publication. Elizabeth suggested that peer review of the ‘living article’ online could be the next step. Open peer review, with reviewer reports published online, would allow readers to see the conversation between authors and reviewers, as well as encouraging transparency of the system and high quality and constructive reviews. On the topic of encouraging new and early career researchers, Andy raised the need for everyone to be involved in training the next generation of reviewers. There is more work to be done to engage younger reviewers and reviewers from all over the world. Andy gave the example that there are twice as many papers published by Chinese authors as the number of Chinese reviewers. We need to continue to find new ways to engage with this emerging network and support it. Patricia highlighted the importance of mentoring new reviewers and how guides such as the BES Guide to Peer Review are fantastic resources for early career researchers. All participants agreed that it is important for senior researchers to encourage their students to review, putting them forward for reviews if they decline and holding group review sessions, which we also strongly encourage. There was a lot more discussed by the panel on the day, so if you missed out, we will be posting the video of the whole session on the BES website early next year. In the meantime, you might also like to see our Storify. It is clear that although there are already a lot of initiatives, experiments and resources in place to improve the peer review process, we still have a long way to go to further engage with different groups and to make the peer review system more efficient. Please let us know your thoughts and suggestions by continuing the debate using #BESPeerReview.